Before the Second World War, women were expected to be 'housewives' or perhaps to do certain 'women's jobs', such as nursing or being a domestic servant or shop assistant. The war changed the world of work for women for ever. When men went to fight, women were called upon to fill their jobs, and this included many jobs that were previously thought of unsuitable for women. Women were called up for war work from March 1941. Women were required by the government to work. At first, only single women aged 20-30 were called up, but by mid-1943, almost 90 per cent of single women and 80 per cent of married women were working in factories, on the land or in the armed forces. plus many more who flew unarmed aircraft, drove ambulances, worked as nurses and worked behind enemy lines in the European resistance. 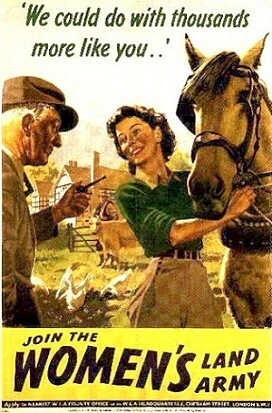 What was the Women's Land Army? As the prospect of war became increasingly likely, the government wanted to increase the amount of food grown within Britain. 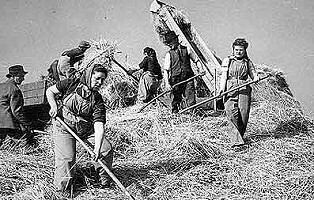 In order to grow more food, more help was needed on the farms and so the government started the Women's Land Army. 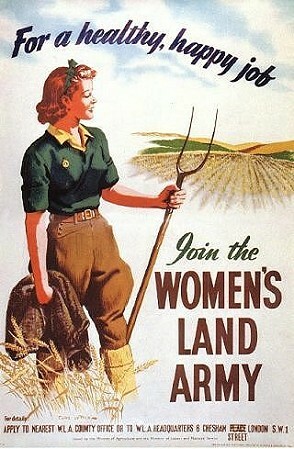 The Women's Land Army was set up in June 1939. What kind of jobs did the Land Army do? The girls of the land army looked after animals, ploughed the fields, dug up potatoes, harvested the crops, killed the rats, dug and hoed for 48 hours a week in the winter and 50 hours a week in the summer. The women earned £1,85 for a working week with a minimum of 50 hours. In 1944 the wages were increased to £2.85. 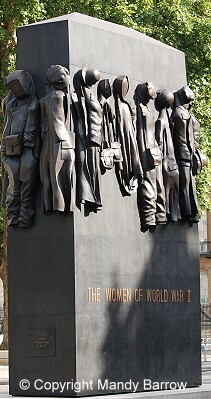 The memorial stands in Whitehall, about a hundred yards from the cenotaph. 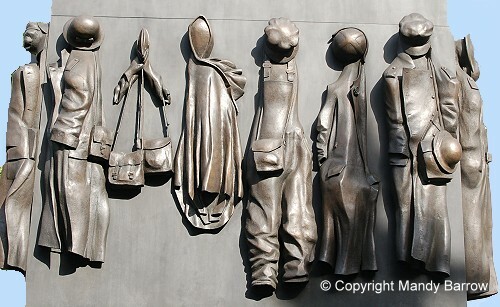 The 22ft-high bronze sculpture depicts the uniforms and working clothes worn by women during the war. 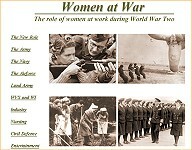 Find out more information about the important role of women during the war. Stories of real women in the Second World War, including journalists, secret agents and resistance fighters, as well as ordinary civilians.